In real project implementations, there is often a need to save user data in session so that you can access. In this post we will be looking at how to save this user information in session when the user logs in into the application. Thanks to my colleague and friend Mohan with whom I discussed the same. Created a simple ADF Web Application in developer. We will be using HR Schema and Employee and Department table. 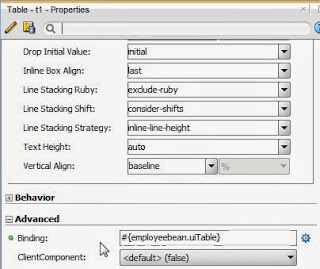 Created entity objects for Employee and Department and their up datable view objects. Added a View Critera in EmployeeVO. This has employeeId equal to a bind variable. This basically apply view criteria to EmployeeVO and fetches all the attributes of the employee based on employeeId and return a Map . Also it saves userName in the session scope as this will be used very often. 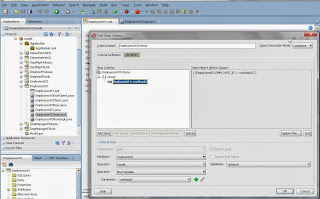 Now expose this method to the client interface so that it is available in EmployeeVO data controls. We are done with our mode part. Now we just need to call this with logged in employeeId. So lets start with View Layer. First we need to create a page which employee will see upon login into the application. So lets create a home.jspx page. This page as simple table in it. EmployeeVO is dragged as readonly table. Now we need to add getUserDetails() method in the bindings of this page. Lets do it. Now we need a place which will call this method with employeeId. Lets create a new bean. 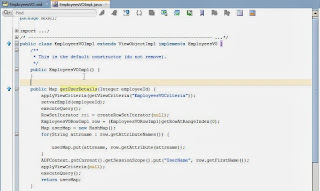 We will write logic to call getUserDetails() method with employeeId in this bean. We will write this logic in constructor of this bean. Below is the code. In this logic, we just retrieved the Map returned by getUserDetails() method and add it to the session scope. We register this bean in unbounded task flow adfc-config.xml in session scope. Ok so we are all set - configured our bean in session scope and it has logic in its constructor to call the method which returns the map of things we need to set in session scope. Now the Big question is when this constructor will get executed. Hmm.... for this we need to bind any UI component of the page with this bean. This is because, when we will bind any component, the bean will be loaded when the page is loaded. 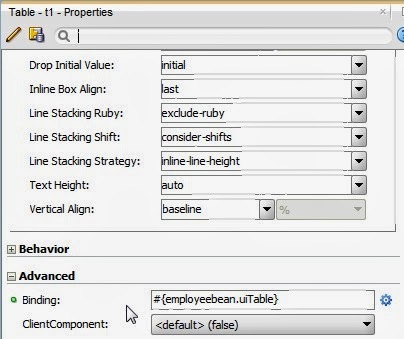 I will bind the the table component with a property in the bean. Now let do something to test UserName on the page. Added output text with value user name from session scope as below . And one important thing which we forgot. 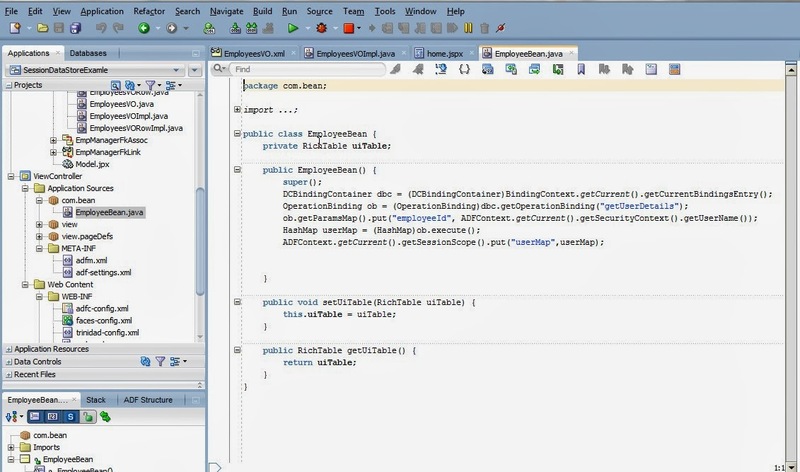 Enable ADF Security and give grants to home.jspx page in jazn-data.xml to aunthicated-user role. Also add a user in security-relams in WLS console with name 101 which is employeeId. Now lets run home.jspx and see. Login page comes up. Enter user as Employee Id 101 and password. So here is it. It shows employee name of logged in employee. Similarly we can pull our any information about the employee form the Map saved in the session scope. This will be done in Weblogic admin console and security relams. There will be all application roles and users there. Or you can add new user and associate it with application roles. Please feel free to email me if you have any specific questions. 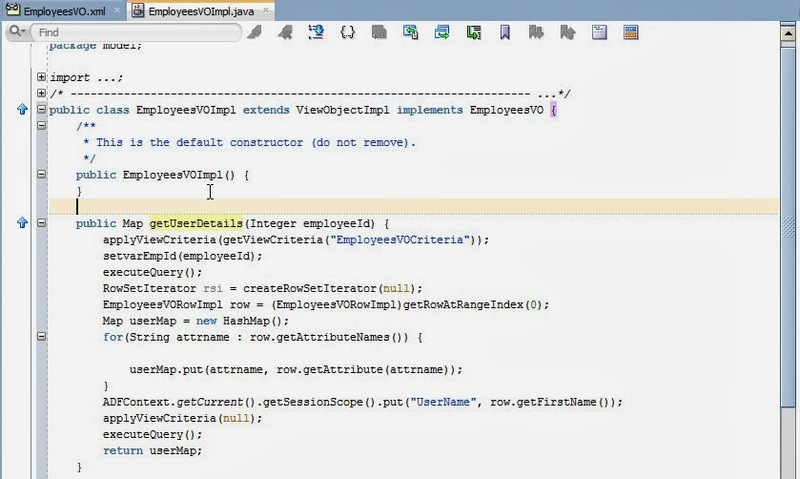 This can be done if you create your employeeVO with bindVariable/ViewCriteria as employeeName/Id. 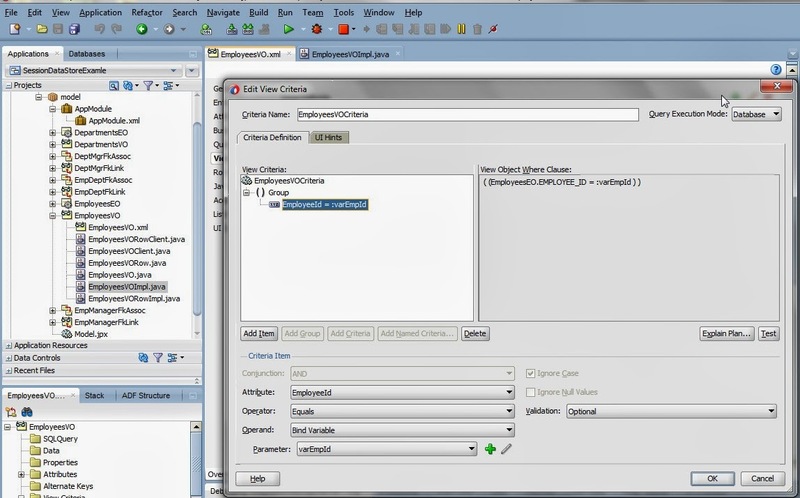 Get the employeeName/Id from the session and reexecute the VO with employeeName/ID as value to bindVariable. This will show only logged in user record. Your most Welcome Elie !! I am a beginner in ADF and I am stuck with adf login using datas in my database with adf security. Could you help me by publishing a post on how to complete the same. Hi. 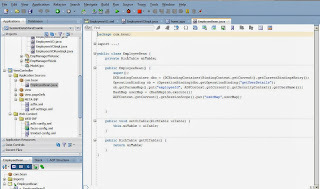 I have been trying to maintain a single session for user in adf. What I have done is I have created a login page and now what I want is that if the user is already logged in once and tries to login again from another tab or browser then he should be prompted that You are already logged in or Please log out before login. Besides if the user still logs in then the session of previously opened login page should be terminated and the user should be allowed to login. I have posted the query on oracle forums and they have mentioned something about Oracle Access Manager, but I am unable to get it. Could you please help me with the same. A code/blog or video would be much appreciated. Are you looking to earn cash from your websites/blogs by using popunder ads? In case you do, have you tried using Propeller Ads? how to display user description after login instead of user name. 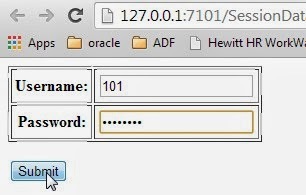 hi i have httpsession how i can get current user from session ? Nice post ! Thanks for sharing valuable information with us. Keep sharing..